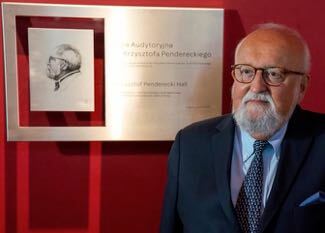 KRAKÓW – Krzysztof Penderecki does not make music for movies, directors make films for his music. 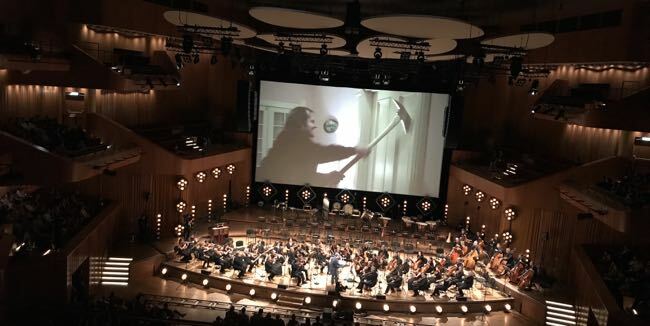 That, at least, is how it appeared at the Kraków Film Music Festival’s Penderecki2Cinema concert Wednesday evening. The legendary Polish composer (above), celebrating his 85th birthday, was on hand to accept several standing ovations after conductor Dirk Brossé led the National Polish Radio Orchestra through four of his most acclaimed works that were written for the concert hall but have featured in iconic movies by directors such as Stanley Kubrick, Martin Scorses and Andrzej Wajda. Filmmakers must have asked themselves a similar question over the years and the many clips shown during the concert suggest they often succeeded. Maestro Brossé’s command of the music was majestic as the orchestra gave spine-tingling renditions of “Threnody to the Victims of Hiroshima for 52 Strings”, “Symphony No. 2, I-II Moderato – Allegretto”, “Polymorphia for 48 strings” and “Symphony No. 3, IV Passacaglia – Allegro Moderato”. Scenes from William Friedkin’s “The Exorcist” (1973), Kubrick’s “The Shining” (1980, above), Peter Weir’s “Fearless” (1993), Cuaron’s “Children of Men” (2006), Wadja’s “Katyn” (2007), Scorsese’s “Shutter Island” (2010), Pablo Larraín’s “Neruda” and David Lynch’s “Twin Peaks” (2017) illustrated Penderecki’s already vividly evocative expressions of emotion. His music is shattering as tension grows portentously, bows drawn achingly, eldritch sounds filled with menace that tickle the back of the neck; cacophonous with the strings of bass, cello and violin plucked and scratched, bouts tapped and slapped, building to a clamorous frenzy like a flock of disturbed ravens crying havoc, fleeing in chaotic panic from some nameless dread; and celebratory as horns and woodwinds begin to soar. No wonder filmmakers cannot resist. 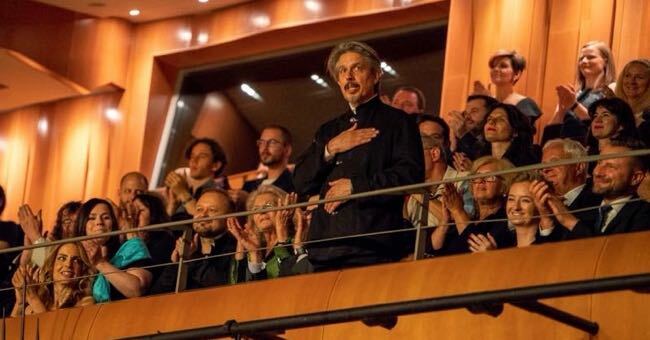 The other highlight of the evening was the world premiere of Oscar-winning American composer Elliot Goldenthal’s breathtaking “Concerto for Trumpet and Strings”, which he wrote as the result of receiving the festival’s first Wojciech Kilar Award in 2015. Dedicated to 18th century Polish hero Tadeusz Kościuszko, a formative figure in the American Revolution, Goldenthal (above) said he was inspired by the bugles that call out from the tower of St. Mary’s Church in Kraków’s Grand Square every hour of every day. His enthusiasm for the performance of the orchestra and the splendid tone of Norwegian trumpet soloist Tine Thing Helseth was matched by the audience’s eruption of appreciation for musicians and composer at the end of the 17-minute concerto. Challenging, complex and eloquent, it offers passages that invite rapt attention and then splinters into unexpected dips, dives and flights of power and emotion. Goldenthal said afterwards that he would love to have the same orchestra, conductor and soloist make the first recording of the concerto. The evening began with three Penderecki pieces in the Baroque style and then, in the absence of this year’s Kilar Award-winner Michael Nyman’s, a performance of his “The Piano for Strings” from the soundtrack of Jane Campion’s 1996 picture “The Piano”. 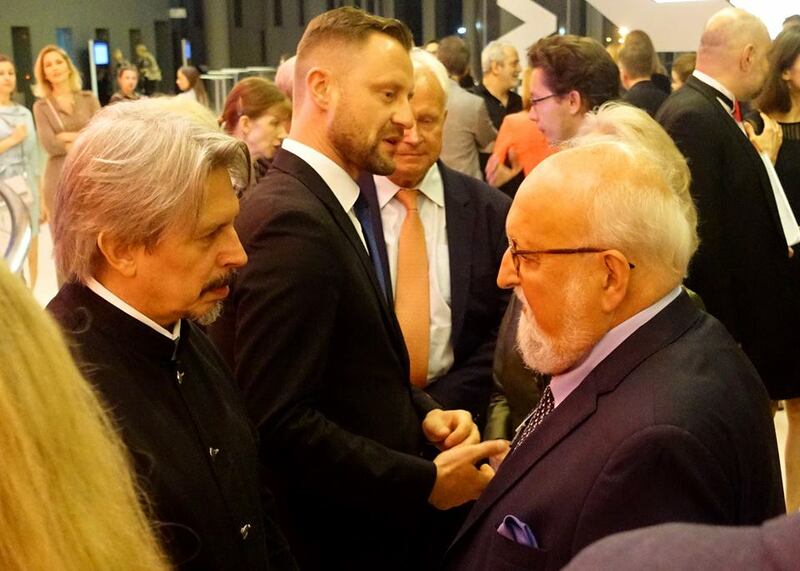 This entry was posted in Film, Krakow Film Music Festival, Music, News and tagged 'Concerto for Trumpet and Strings', Dirk Brosse, Elliot Goldenthal, ICE Kraków Auditorium Hall, KFMF18, Krakow Film Music Festival, Krakow Mayor Jacek Majchrowski, Krzysztof Penderecki, Krzysztof Penderecki Hall, Michael Nyman, National Polish Radio Orchestra, Penderecki2Cinema, Robert Townson, Tadeusz Kościuszko. Bookmark the permalink.